So, if we have so many things to which to look forward when change is afoot, why do we fear it so much? 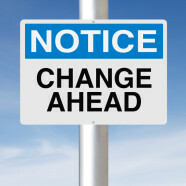 Can you see change coming on the horizon in your work life? Are you feeling at all anxious about it? Where is this anxiety or fear coming from? Might it be grounded in the not knowing, the uncertainty of what your future work life will look like and/or the fear that you are not capable enough to navigate it, that it will be too hard or that you will fail. If so, although you KNOW you cannot, do you find yourself thinking you’d rather stay where you are now, because at the very least you KNOW you’re “okay”, no matter how unfulfilled or miserable you may be? Yes, where we CAN feel awkward as “Change” approaches, and we CAN reconnect with old sadness and fear in the process we can also be reminded of the fondness we have for the part “Change” has played in our growth and development, both personally and professionally. And for ME, at this moment, as I immerse myself in and commit to the blogging process, I AM still actively summoning as much courage as I can to meet with my friend, “Technological Change”, face to face, here and now. And, at the same time, I am ALSO grateful – truly – for the personal and professional growth I’m experiencing through this process. And so it goes … ready, set, clicking “Publish”! And there we have it, Blog #1.